Three award winning Yorkshire breweries have collaborated to launch a mixed pack of craft beer that has won a listing in selected Majestic stores. The ‘Yorkshire Six Pack’ features two beers from each of West Yorkshire based Saltaire Brewery, Vale of York based Rudgate Brewery and Wolds based Wold Top Brewery and represents the variety of beers brewed in Yorkshire. Saltaire’s contribution to the robust boxed set is Saltaire Blonde, 4%, a golden ale with a touch of malt and a light, spicy hop flavour and Cascade Pale Ale, 4.8%, an American style pale ale that is characterised by its pine and grapefruit aroma from the American Cascade hops. Cascade Pale Ale was awarded Silver in the Premium Bitters category at SIBA North East 2013 and Bronze in the Bottled Premium Bitters, SIBA Great Northern Beer Competition 2012. To complement Saltaire’s pale beers, the Yorkshire Six Pack includes Rudgate Brewery’s Battleaxe Bitter, 4.8% and York Chocolate Stout, 5%. The bitter is a complex, chestnut coloured best bitter with a memorable fruity flavour whilst the full bodied stout is a deeply rich and satisfying beer brewed using Columbian chocolate from York’s famous Cocoa House to deliver a subtle chocolate finish. York Chocolate Stout was awarded Champion Speciality Beer at York Beer Fest 2012. Tasting different again, due to chalk filtered water that comes from high on the Yorkshire Wolds, Wold Gold, 4.8% and Angler’s Reward, 4%, complete the pack. Blonde, continental style Wold Gold is brewed from Wolds grown barley and is a soft, fruity beer with a hint of spice whilst Angler’s Reward is a golden pale ale with a fruity bitterness and a lingering aftertaste. Wold Gold won the coveted 3 Star Gold Award at the Guild of Fine Food’s Great Taste Awards 2013, took Gold in the bottled gold beers category of the SIBA Great Northern Beer Competition 2012 and Bronze in the bottled gold beers category, SIBA BeerX national competition 2013. 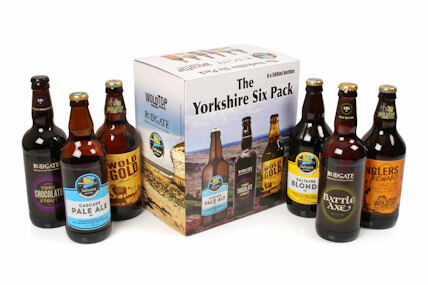 The Yorkshire Six Pack is available in Majestic’s Yorkshire stores from 6th November. Saltaire Brewery is famed for producing hand crafted ales with a contemporary twist from its brewery that is housed in a former Victorian power station on the edge of the World Heritage site at Saltaire. Rudgate Brewery was founded in 1992 in the former ammunition building of RAF Marston Moor Airfield and takes its name from the Roman road that runs through the airfield. It now produces CAMRA championship beers from a modern brewery on the airfield. Farm based Wold Top Brewery brews traditional real ale from home and Wolds grown malting barley, the finest hops and pure, chalk-filtered Wolds water.